Labour will lose a big chunk of support if it doesn’t oppose Brexit. If there was an election before Brexit, just 19% of people would vote for Labour if it doesn’t oppose Britain’s EU exit, while the Conservatives would be 9 percentage points ahead, a YouGov poll has found. Support for the anti-Brexit Lib Dems would jump to 17%. However, Labour would be much closer to the Tories and way ahead of the Lib Dems if it opposed Brexit. Jeremy Corbyn is under increasing pressure from Labour members to stand against Brexit. LONDON – The Labour Party will haemorrhage voters to the Liberal Democrats if it doesn’t oppose Brexit, a poll has found, in the latest sign that Jeremy Corbyn’s party relies heavily on support from passionate pro-Europeans. A YouGov poll of over 4,900 people found that if a general election takes place before Britain’s scheduled exit from the EU in March 2019, just 19% of people would vote Labour if the party wasn’t opposed to Brexit. The Conservatives would be nine percentage points ahead on 29%, while the Liberal Democrats would climb to 17%, putting them almost neck-and-neck with Labour. However, if Labour was to officially oppose Brexit, it would receive 26% of the vote, four percentage points behind the Conservatives and sixteen percentage points ahead of the Lib Dems, who’d be on 8%. The poll, commissioned by Best For Britain and Hope Not Hate, suggests that Labour will be punished at the ballot box if it doesn’t argue against Brexit, while the Lib Dems would enjoy a revival fuelled by pro-EU Brits. Reacting to the findings, Labour peer Andrew Adonis said: “If Labour becomes an accomplice to Brexit, it is finished. Labour is coming under increasing pressure to take a softer Brexit position ahead of its autumn conference. The party’s current policy is to negotiate a customs union with the EU and stay as close to the single market as possible. However, most members are opposed to Brexit altogether and want the party to back another referendum. 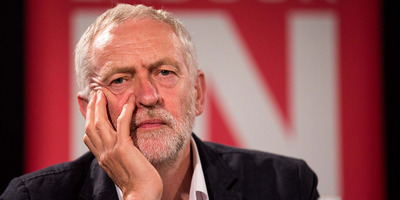 Corbyn’s stance on Brexit is set to be under the spotlight at the party’s conference in Liverpool next month, with tens of local Labour branches planning to submit motions calling for a People’s Vote – a referendum on the terms of any final deal Theresa May brings back to Westminster. “These figures show that Labour would make real gains in the country from a clear anti-Brexit position,” Eloise Todd, CEO at anti-Brexit group Best For Britain said.